From Jeff Paton of Kuna, Idaho on 11/25/2016 . While I primarily used Hot Knife for my low moisture cleaning, I had a bottle of Intensity Red sitting on the shelf that I had not used for a long time. I read how it could be used as a booster, and I applied it to an apartment that I cleaned a year ago with HWE chemicals. This time I pre-scrubbed it with a pad machine and Intensity Red. Without agitation, the Intensity Red did not perform as well as I would like; but a thorough padding before extraction rocks! I thought that I got this place as clean as it could get, but I was wrong! 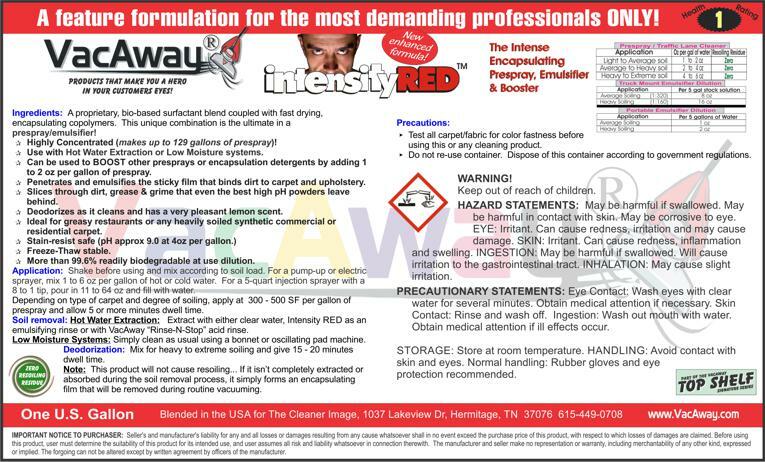 I always pre-agitate my pre-spray in on traffic lanes and stains, but Intensity Red, as long as it is agitated in, took my cleaning to the next level; better than any other pre-spray I have tried for HWE. From Anonymous of Milwaukee, Wisconsin on 11/18/2016 . When doing residential carpet, this is the go to product. Best pre-conditioner I have used in over 17 years of business. It stays within carpet warranties, no residue, and cuts through the grime the best. Hot Knife Extreme is a great alkaline encapsulate only agent, since it is high foam. However, to use it with HWE is a no go. You will go through ALOT of defoaming agent when using it. This is where Intensity Red shines. It is a low foam film forming encapsulant. I don't go through any defoaming agent, unless I'm cleaning up the last cleaners mess. A must have in your arsenal. From Michael Juarez of Riverside, California on 5/8/2016 . I've tried several detergents here and I've mixed a few just to see what would happen. This one seems to be my favorite. I begin to panic when we start running low on this stuff.